We first tasted this incredible dessert while visiting cousins in Finland last summer and collectively agreed we had never tasted anything like it before. 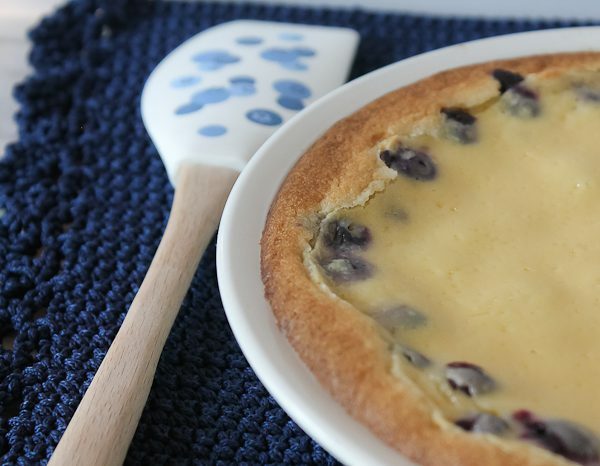 A thick cake-like batter is first made and spread into the pie pan, although it bakes into sort of like a cookie consistency when done. 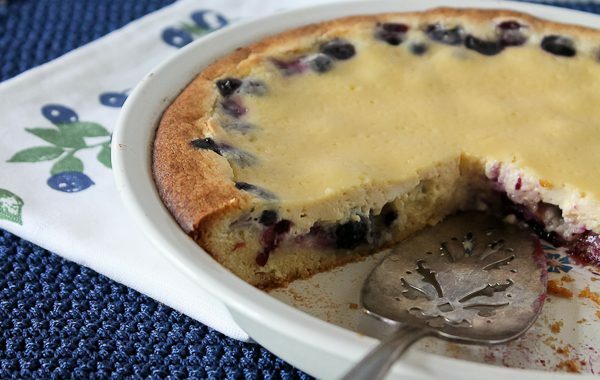 Fresh blueberries (preferably wild) are sprinkled over the raw batter, then topped with a sour cream mixture and baked. I think the only reason it is called a “coffee cake” is because it served with coffee. There is nothing coffee cake about it, not as we know it anyway. You’ll just have to make it to understand how confusing it is to describe this, maybe a pie/cake/sort-of-cookie/custard hybrid. All I can tell you is that it is wonderful. It’s good slightly warm, room temperature, or chilled. I personally like it best when it is completely cooled and at room temperature. It doesn’t need anything else; no whipped cream, no nothing. You can also substitute other berries like raspberries, and someone who I recently gave the recipe to was going to try chopped peaches. Peaches might be a little watery, but I am interested as to how it turns out. 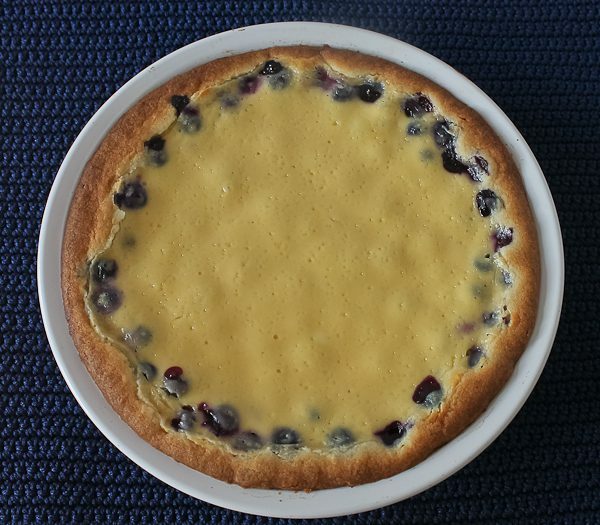 For some reason when I made it this time, only the blueberries on the edges popped up. Usually they pop up all over the pie, and I can see them almost coming through at the top. Not sure what happened, but it tastes the same! So yours may pop up or may not; either way it’s all good. It’s filled with blueberries. The trio will be returning to Finland for each season to make and photograph the local and seasonal foods of the family farm and town of Seinajoki. They are being interviewed by newspapers about their project and everyone around them is so excited to have Seinajoki and the farm in the limelight. I’ll keep you posted of their progress along the way, but be sure and follow them on their social media. Make it yourself and tell me what you would call it! Heat oven to 375 degrees. Lightly grease or coat with cooking spray, a 9-inch pie plate; set aside. For Crust Batter: In bowl of electric mixer, cream together butter and sugar. Add egg and mix well. Add flour, baking powder, and vanilla. Mix to combine. Spoon batter into the prepared pie plate and spread evenly to the edges. 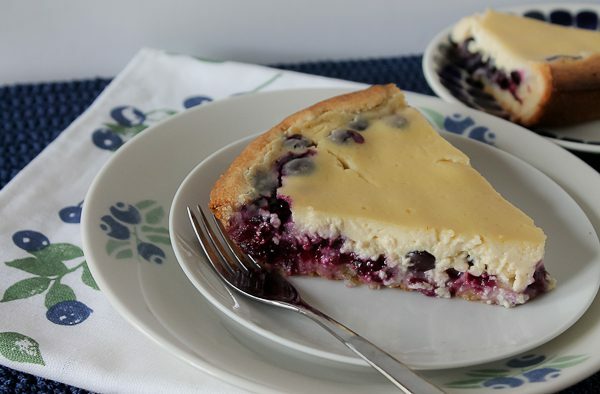 For filling: Sprinkle blueberries over the batter in the pie plate, all the way to the edges. For Sour Cream Topping: In a mixing bowl, whisk together sour cream, sugar, egg, and vanilla. Carefully pour evenly over blueberries. Bake for 27 to 32 minutes, or until the edges are browned and the middle is just set. Cool on wire rack. Cut into wedges to serve. Serves 6-8.
how do I order an advanced copy (autographed, of course) of the book? What an exciting project. You will be one of the first to get one! It will be a while though, since Kristina and her group will be going back to Finland for every season. It definitely is a fun and exciting project! That looks yummy – I just printed out the recipe. Thanks! 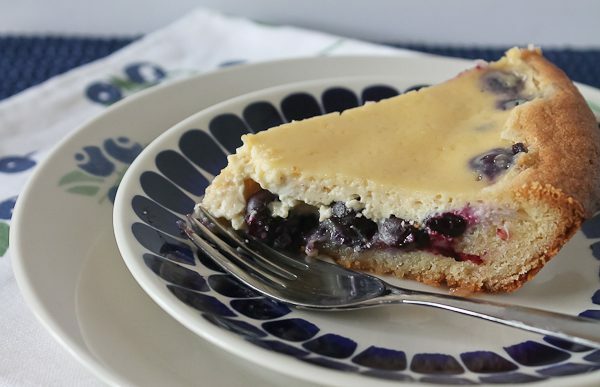 Thanks for sharing this family Finnish recipe. Yum! I will add it to my collection! I quickly signed up to follow Kristina on her cooking adventure in Finland when I read about it on FB. How exciting!! Count me in on some copies of her cookbook when it is ready. I will need some as gifts for family, too!! Thanks, Kim. I think you and your family will love this recipe! It has become one of our favorites from the cousins. The cookbook project is taking off like a rocket and getting all kinds of publicity already in Finland. I’m so excited for Kristina and her “dream team” with photographer and videographer. They had a ball with part one, Spring! Now Summer, Fall, and Winter to go! It will be visually stunning along with incredible recipes. I love the pictures Kristina has been posting along the way. What a wonderful cultural/family heritage/fun/discovering experience. I am so glad she is sharing even little snippets of her adventures now on FB. It is especially engaging for me, whose family heritage is also Finnish but who has never been there. Kiitos! I hope you make it to Finland, Kim. You would never want to leave. There is no place like it on earth. It’s hard to describe its magic.